TROY — The Troy Savings Bank Music Hall recently announced two shows for its upcoming 2018-2019 season. 1964: The Tribute returns to the Hall, bringing the 1960s sounds of The Beatles into the historic building in September, followed by The Portland Cello Project performing the entirety of the now classic 1997 Radiohead album, “OK Computer” in October. Since the early eighties, 1964: The Tribute has been thrilling audiences around the globe by taking them on journey through a quintessential moment in music history that will live forever. Over twenty years of researching and performing have made “1964” masters of its craft. The band is lauded by critics and fans alike as the most authentic and endearing Beatles tribute, which has earned it the distinction from Rolling Stone magazine as the “Best Beatles Tribute on Earth.” 1964 recreates an early ‘60s live Beatle concert with period instruments, clothing, hairstyles, and on stage banter with an accuracy that is unmatched. 1964 is Mark Benson as John Lennon, Mac Ruffing as Paul McCartney, Tom Work as George Harrison, and Bobby Potter as Ringo Starr. 1964 takes the stage on Thursday, Sept. 27, at 7:30 p.m. Tickets range from $29 to $34. For more information, visit http://www.1964web.com. Portland’s premiere alt-classical group brings a huge, orchestral ensemble, including brass and percussion, to perform a night in homage to Radiohead on Saturday, Oct. 27, at 8 p.m.
Patti King of the Portland band The Shins is the guest vocalist for this evening. Expect unique renditions of classical Radiohead pieces that wander from truly epic to breathtakingly intimate. The first set of the evening is a selection of various Radiohead songs and the second set is, from start to finish, Radiohead’s “OK Computer” album. “OK Computer” is a historic album that has proven over the years to yield an infinite variety of artistic inspiration to people of all walks of life. 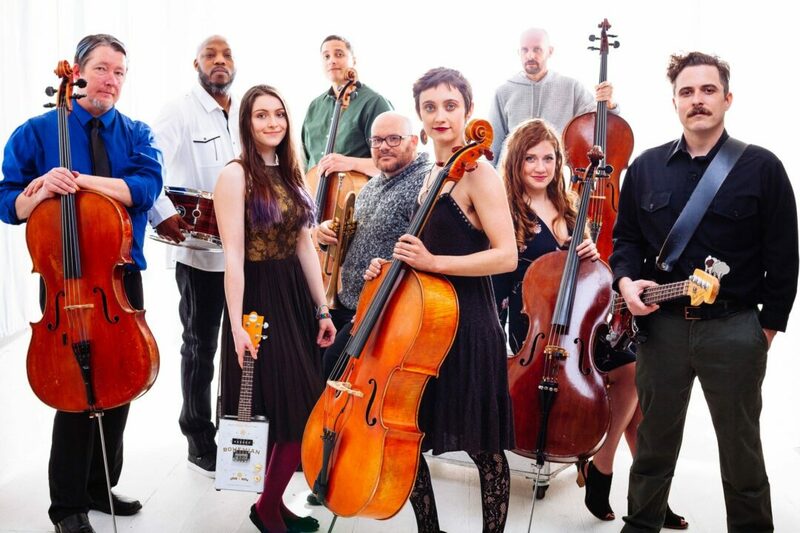 Cello Project first performed the record in its entirety in 2012 for the 15th anniversary of the album’s release, and ever since then, pieces of it have remained in the group’s repertoire as constantly evolving musical meditations. All of the cellists in the group are classically trained, and yet, all of them seem to find a unique connection between Radiohead and their musical foundation. The deep layers of sonic ecstasy are reminiscent of so much late-19th-century music of the Western Classical Tradition, but beyond that, each of the cellists have worked to bring out subtleties they discover that hint at everything from Bach counterpoint at times, to rhythms they initially learned counting and performing Stravinsky. Ticket costs range from $29 to $36. Tickets are available at the Troy Savings Bank Music Hall Box Office, 30 Second Street, Troy, Monday through Friday 10 a.m. to 5 p.m. More information on the Troy Savings Bank Music Hall and upcoming programs is available on the website at www.troymusichall.org. The Troy Savings Bank Music Hall has hosted performances by legions of world-renowned artists, from legends like Dizzy Gillespie, Ella Fitzgerald, Isaac Stern, Sergei Rachmaninoff, and Vladimir Horowitz, to the best on today’s contemporary music scene, including Joshua Bell, Andrew Bird, Steve Martin, Lyle Lovett, and John Prine and many others.